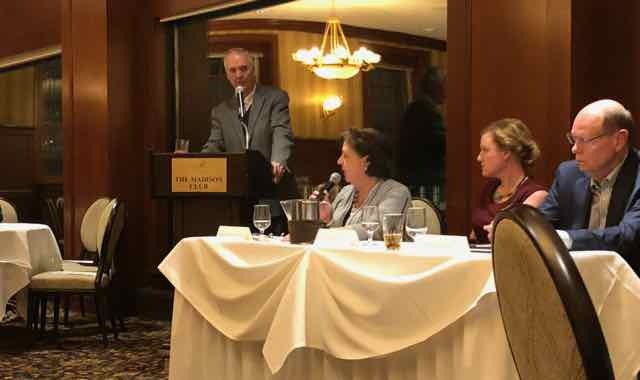 The Madison Club hosted a panel Tuesday to discuss the state of media in 2018 and the “fake news” phenomenon. The panel expressed their concerns with the term “fake news” and who needs to be accountable for publishing and spreading factual pieces. Wispolitics.com President, Jeff Mayers, moderated the panel. There are multiple things that are lumped under the title of fake news, said Kathleen Bartzen Culver, Director of the Center for Journalism Ethics. The term has transitioned from something that describes falsehood to becoming something that is “weaponized” that people can use against an issue with which we don’t agree. “I think [journalists] do have to be very careful to be specific,” Culver said. 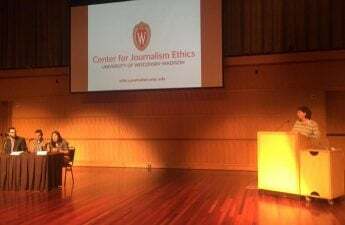 The problem with the term fake news is how people have turned it into a term for something they do not agree with or which does not align with their political views, assistant news director and reporter for WISC-TV, Jessica Arp, said. 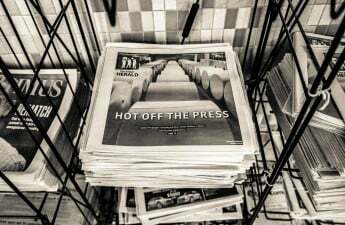 Reader accountability is also an important aspect of the media today, editor and executive publisher of The Capital Times, Paul Fanlund, said. When people get their news, they are going to the news sources they have always used, whether factual or not. The reader is accountable for choosing news sources producing factual stories, Fanlund said. Arp disagreed on this matter and said it was the media’s responsibility to always fact-check to produce content readers can trust. Audience members raised concerns about social media’s biased algorithms and their effect on media. Arp commented on Facebook’s recent announcement about its news algorithms where users will see publishers less and friends and family more. This is problematic because hiding news is not the answer to fake news. Rather, highlighting factual stories should be the focus.